HF is also a leading cause of hospital readmission in Hong Kong. At the inaugural Asia Pacific Advanced Heart Failure Forum (APAHFF) held in December 2017 in Hong Kong, delegates from over 10 countries convened and shared experiences and knowledge.3 It is clear that access to advanced HF therapies, services, end-of-life care and support in the East has been relatively limited compared with the West. 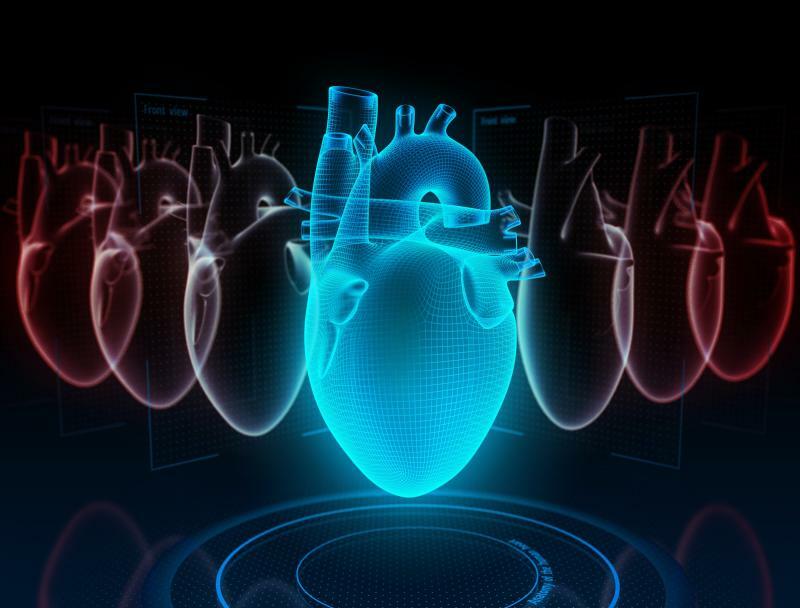 While future growth and development in the management of advanced cardiovascular disease are expected, most healthcare systems in Asia will continue to rely on medical and supportive therapies. In this case report, we present the challenges encountered by physicians and cardiologists managing patients with advanced HF, and highlight the broadening spectrum of medical therapies and pathways that comprise contemporary practice. A 61-year-old male former heavy smoker and nondrinker was admitted via the Emergency Department with a 1-week history of progressively worsening shortness of breath, leg swelling and inability to lie flat with accompanying breathing difficulty. He denied having experienced any chest pain, palpitations, blackouts or other chest discomfort. He disclosed marked shortness of breath on the day of admission and continued experiencing shortness of breath while resting on two pillows. During the previous year, his exercise tolerance had decreased to less than one flight of stairs and he could not walk a block on level ground without stopping to catch his breath. Although he claimed to have good medication adherence, he continued to eat out several nights a week. He lived alone, spent most of his time indoors, and had few friends and little social support. His past medical history included four previous admissions during the last year for decompensated HF, ischaemic dilated cardiomyopathy (left ventricular ejection fraction [LVEF], 15 percent; implantable cardioverter defibrillator declined), advanced three-vessel coronary artery disease not amenable to revascularization, type 2 diabetes mellitus, glomerulonephritis secondary to pauci-immune type (cANCA– and anti-proteinase 3–positive) vasculitis, acute kidney injury, anaemia, and closed pulmonary tuberculosis with ongoing antituberculous medical therapy. His home medications included metoprolol succinate (25 mg orally daily), lisinopril (10 mg orally daily), eplerenone (25 mg orally daily), ivabradine (7.5 mg orally twice a day), atorvastatin (10 mg orally daily), linagliptin (5 mg orally daily), aspirin, tamsulosin, tiotropium bromide, lansoprazole, antituberculous antibiotic therapy (isoniazid, ethambutol, rifampicin, pyrazinamide) and pyridoxine. On physical examination, the patient appeared cachectic and frail, with a body weight of 51 kg. His blood pressure was 92/62 mm Hg, and his pulse was weak but regular at 100 bpm. His jugular venous pressure was 15 cm. He had an S3 gallop. Bilateral lung crackles and pedal oedema were present. Haemoglobin was 10 mg/dL and the rest of his complete blood count was unremarkable. His blood biochemistry was notable for sodium 130 mEq/L, urea 5 mmol/L and creatinine 140 μmol/L. Liver function was normal. HbA1c was 6.2 percent. Cardiac troponin was minimally above upper limit of normal and remained static. Chest X-ray showed bilateral diffuse infiltrates consistent with pulmonary oedema. Electrocardiogram (ECG) revealed sinus rhythm at 80 bpm with QRS interval of 125 msec and no left bundle branch pattern. Echocardiography showed an LVEF of 15 percent, dilated LV chamber size (LV end-diastolic diameter, 6.2 cm), moderate secondary (functional) mitral regurgitation with an eccentric jet, mild-moderate aortic regurgitation with a normal trileaflet aortic valve, mild aortic ectasia (3.8 cm), and no pericardial effusion. The patient was well decongested after 5 days of diuresis (furosemide 40 mg intravenously twice daily) and was subsequently transferred to another affiliated rehabilitation hospital for further optimization of care. 1. Based on the above list of home medications that were all restarted prior to transfer, what other changes could be made to optimize the patient’s HF medical therapy? 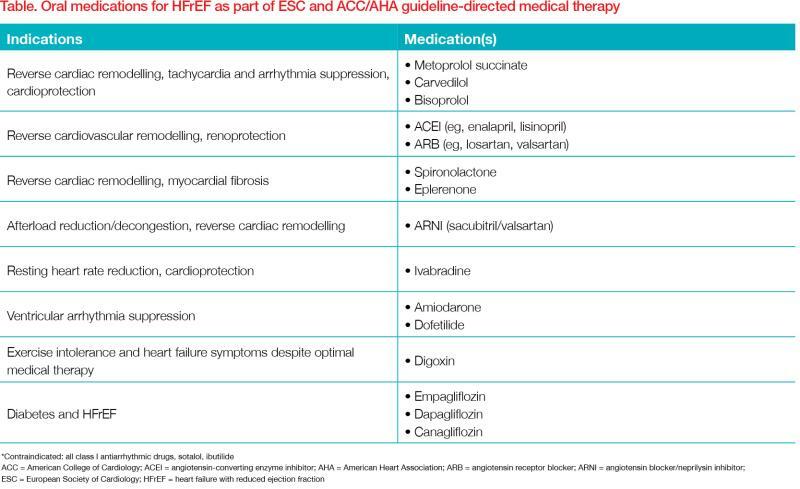 Guidelines of the European Society of Cardiology (ESC) and American College of Cardiology/American Heart Association (ACC/AHA) advocate guideline-directed medical therapy (GDMT) as this approach has been shown to reduce mortality, morbidity and rates of hospitalization in patients with HF.4-6 To customize and optimize the patient’s treatment, risk stratification is essential. This patient had New York Heart Association (NYHA) functional class IIIB/IV and ACC/AHA stage D HF. 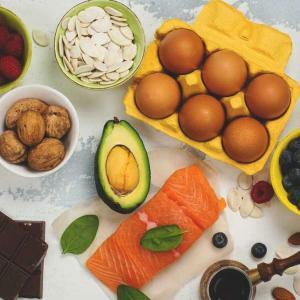 The Seattle Heart Failure Model showed that his estimated mean life expectancy was 2.6 years, while estimated 1-year and 2-year survival rates were 72 percent and 51 percent, respectively. As the patient had been hospitalized for decompensated HF previously, his future risks for adverse clinical outcomes including rehospitalization, ventricular arrhythmias, sudden cardiac arrest and death will continue to increase. Although his GDMT consisting of metoprolol succinate, lisinopril, eplerenone and ivabradine reduced his risks for adverse events, there was still room for further optimization and risk reduction. Both the ESC and ACC/AHA guidelines recommend maximum dose of angiotensin-converting enzyme inhibitor (ACEI) as tolerated. For lisinopril, the maximum dose is 40 mg orally daily. The PARADIGM-HF study, which compared enalapril with an angiotensin receptor-neprilysin inhibitor (ARNI), valsartan/sacubitril, showed reductions in cardiovascular death, HF hospitalizations and all-cause mortality in patients with HF with reduced ejection fraction (HFrEF) with the ARNI.7 Since publication of these results, ARNI has expanded our armamentarium for the treatment of patients with NYHA class II–III HF. However, critics of the study have argued that the enalapril dose of 10 mg orally twice daily was suboptimal (<20 mg twice daily). On day 3 after transfer from the acute hospital (ie, day 3 in the rehabilitation hospital), the patient was noted to be hypotensive 2 hours after administration of his morning medications, with blood pressure dropping to 66/38 mm Hg and 64/36 mm Hg on repeat measurements, heart rate of about 60s bpm, and oxygen saturation of 98 percent in room air. The patient remained alert and oriented with fluent speech, although he did complain of slight lightheadedness. He was free of chest pain or symptoms. On physical examination, his jugular venous pressure was not elevated, chest was clear, periphery was cool but not diaphoretic, and there was no evidence of volume overload. His intake and output over the past 3 days had been between –500 mL and –1,000 mL. Bedside point-of-care testing of blood glucose level was unrevealing, and ECG showed sinus rhythm in the range of 60s bpm without any acute ST segment or T wave changes. 2. What would be the next course of action? Based on the Acute Cardiovascular Life Support algorithm, the patient’s problem was determined to be primarily circulatory. He was placed in a slight Trendelenburg position and continuous ECG monitoring was started. No other acute causes could be identified. His cardiac medications, including as-needed diuretic regimen, were withheld. Review of his medication list and dispensary records was unremarkable. 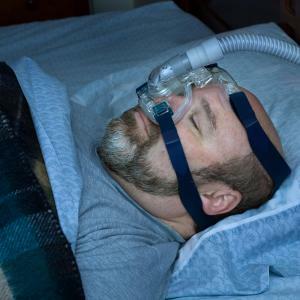 As physical examination and assessment did not suggest acute pulmonary congestion, it was decided that gentle hydration with careful monitoring was appropriate. 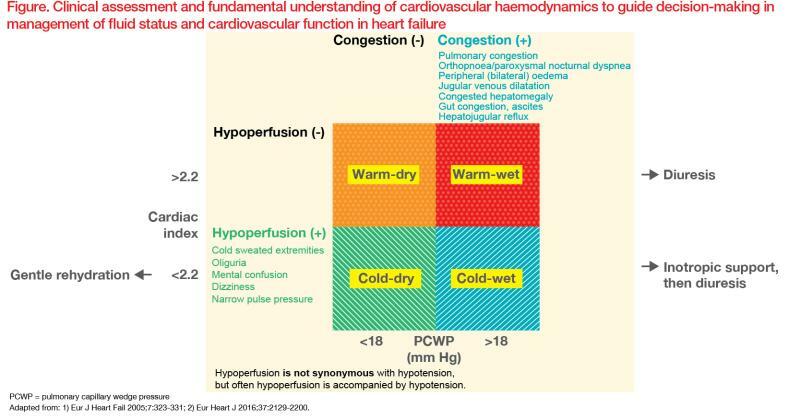 (Figure) Prompt intravenous infusion of normal saline over 1–2 hours resulted in improvement of the patient’s systolic blood pressure to 90–100 mm Hg and resolution of slight lightheadedness. The patient’s fluid balance and body weight were kept stable for the remainder of his hospitalization until discharge. His HF medication regimen was progressively reinstated with the exception of ivabradine due to significant hypotension at each attempt to restart it. 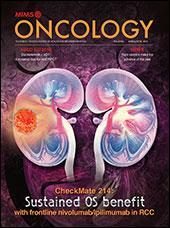 For this reason, an ARNI or SGLT-2 inhibitor could not be introduced. He completed a course of rehabilitation, and at discharge his heart rate averaged 80 bpm and systolic blood pressure was around 90 mm Hg. Advance care planning and primary level of palliative counselling were provided.11 He was discharged to home with early follow-up and planned for consultation with the palliative medicine team. Ivabradine has been demonstrated to reduce the primary composite endpoint of cardiovascular death and HF hospitalization by 18 percent in SHIFT, a randomized placebo-controlled study,15 and by 13 percent in a combined analysis of data from the SHIFT and BEAUTIFUL studies irrespective of the primary aetiology of LV systolic dysfunction.16 However, the development of hypotension and tenuous haemodynamics on a previous HF regimen is concerning. There were many therapeutic opportunities for GDMT in this patient. Unfortunately, when patients with advanced HF develop pump failure, negative chronotropic and/or vasodilatory medications may have to be discontinued. This is a poor prognostic sign. Studies have shown that in-hospital hypotension during hospitalization for acute HF is associated with a two-fold increased hazard of 30-day mortality.17 Although bradycardia is an intended therapeutic action of ivabradine, hypotension can result from a reduction in cardiac output (a product of heart rate and stroke volume) in advanced HF, particularly when ACE/angiotensin receptor inhibition and maintenance diuresis are needed. The relatively newer, outcome-improving medications including ivabradine, ARNI and SGLT-2 inhibitors all share the common side effect of hypotension. In this case where a hypotensive episode was precipitated by morning dosing of medications, despite ‘un-stacking’ of medications (ie, dispensing medications split between morning and evening), the patient’s blood pressure remained tenuous. Current guidelines do not provide detailed recommendations on how to prioritize discontinuation and/or addition of guideline-directed drugs for advanced HF, particularly when hypotension is problematic. While an individualized approach is taken, the clinician will have to weigh the effect size of one drug against the potential downside of altering the balance of the therapeutic regimen in a fragile patient approaching end of life. Finally, an important aspect of the care and management of advanced HF is early introduction of palliative care to provide counselling and assist patients in decision-making at different phases – from advance care planning to the eventual end-of-life pathway, even when left ventricular assist device (LVAD) therapy is being considered. This management paradigm remains relatively new, but both patients and clinicians are increasingly aware of the importance of shared decision-making and the increasing availability of options near the end of life. While LVAD as destination therapy may be unsuitable, unavailable or unaffordable to most patients in Asian countries, the use of newer therapeutic agents such as ARNI, ivabradine and SGLT-2 inhibitors, as well as early palliative care, will have a positive impact on important outcomes including quality of life, NYHA functional class, hospitalization and, possibly, mortality.